Be the first to share your favorite memory, photo or story of Rosetia. This memorial page is dedicated for family, friends and future generations to celebrate the life of their loved one. 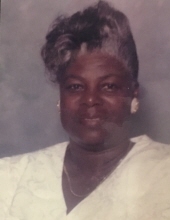 Rosetia D. Lewis, 78, of St. Thomas, died Saturday, November 10, 2018, at her residence. Rosetia Dorothea Anthony Lewis, 78, died Saturday, November 10, 2018, at her residence. She was born Nov. 03, 1940 on the Island of Antigua in St. Mary’s Parish to Julia and Simon Anthony. She attended Greenbay Girls and Princess Margaret Schools. After school, she worked at Lakes Su-permarket and Torry’s Store. January 1965, Rosetia immigrated to England where she resided and worked doing garment finishing for over 6 years before returning to Antigua to marry Donald Lewis, the man she loved, August 10, 1971. January 1972, the newlyweds started a new life in St. Thomas and had two daughters. Rosetia worked at Bachman’s Bakery, now Breads and Cakes for many years before retiring. Rosetia was a people person, nice to everyone, always with a smile and an encouraging word, especially for young people. Rosetia’s greatest wish was to see her daughters grow up God faring, respectable, well mannered and educated women. And they have made her proud. She wished the same for her grand daughters. May she rest in peace. Special Cousins - Eugene Marsh Sr., Rudolph Harris, Irma Harris, Barbara White, Louise Brown, Steve Anthony, Eliza Chinnery. A host of great nieces, great nephews, family and friends too numerous to mention. Relatives and Friends are respectfully invited to attend the first viewing from the Celestial Chapel of the Dan Hurley Home for Funerals on Monday, November 26, 2018, from 5:00-7:00PM. The funeral service will be held on Tuesday, November 27, 201 8, from All Saint Cathedral at 9:30AM. Interment, Eastern Cemetery, Smith Bay. To plant a tree in memory of Rosetia D. Lewis, please visit our Tribute Store. "Email Address" would like to share the life celebration of Rosetia D. Lewis. Click on the "link" to go to share a favorite memory or leave a condolence message for the family.